The £1.35bn Queensferry Crossing spanning Scotland’s Firth of Forth has opened to traffic for the first time. Spanning 2.7km, the new structure is the longest three-tower cable-stayed bridge in the world. Prior to being connected to the shore on both sides, its balanced cantilevers extended 322m north and south of the central tower, which is also an official Guinness world record. Since 2011, the bridge has seen over 15,000 people inducted to work on the site, and a total of 18 million man hours have been dedicated to the project. 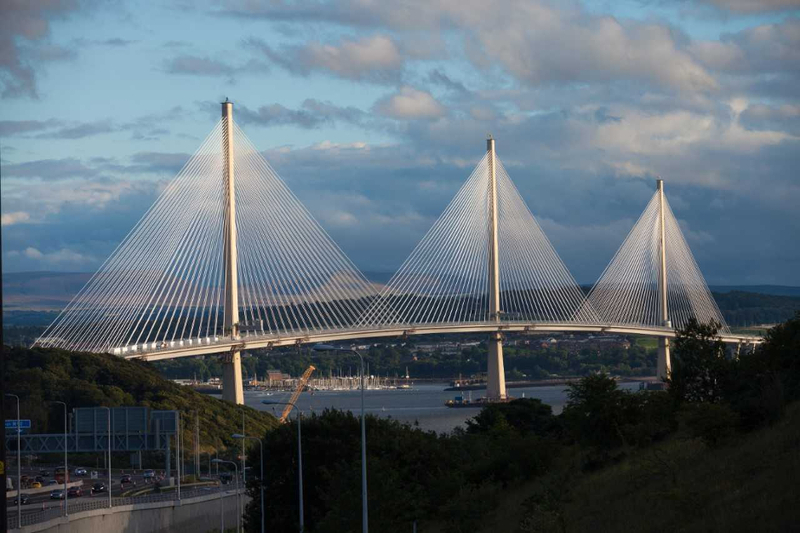 The principal contractor, Forth Crossing Bridge Constructors (FCBC), comprised a consortium of Hochtief (Germany), American Bridge (US), Dragados (Spain) and Morrison (Scotland). Official sources claim the development came in £245m under budget. “I’ve worked on projects across the globe and I can safely say that this has been one of the most challenging but also the most rewarding,” said project director David Climie, from Transport Scotland. 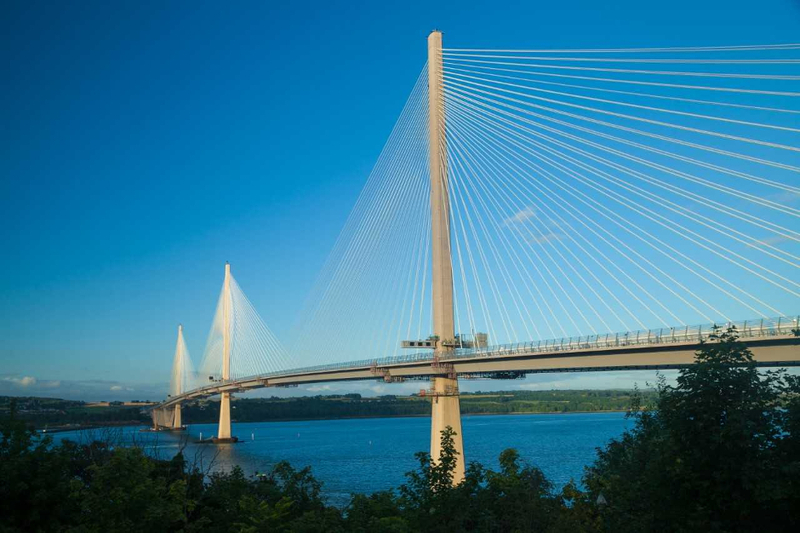 The Queensferry Crossing was first conceived in the mid 2000s after inspection of the Forth Road Bridge revealed extensive corrosion of its suspension cables. While measures have been put in place to mitigate that corrosion, it was decided a new road bridge was required. The older structure will now carry pedestrians, cyclists and buses. All other vehicle traffic will use the new bridge, which links into major motorway upgrades north and south of the crossing. The two road bridges sit alongside the iconic Forth Bridge, which opened in 1890 and still carries rail traffic. Initially, a 40mph speed restriction will be in place on the new bridge’s two-lane dual carriageway. Once upgrade work is completed on the Forth Road Bridge over the next 4-6 weeks, public transport will be redirected there, and the speed limit on the Queensferry Crossing will be raised to 70mph. This weekend will see 50,000 ballot-winners walking the new bridge in a celebratory ceremony, and the crossing will be officially opened by the Queen on Monday 4 September. Who is going to pay for the maintenance of the old (only 50 years old) now it is only going to be used by pedestrians and cyclists? I have no idea of the annual costs of operating a structure like a bridge, but I bet it isn’t cheap! I am sure the cost of taking the old bridge down would be even more prohibitive than the cost of looking after it, but………. Who is doing the sums in the UK now? Is anyone doing sums at all? A short piece from a description of this and other visits may amuse. “The Engineering and Scientific Societies, all completely student run, offered outside visits to places of interest. Coaches full of high spirited students travelled all over Scotland. To a coal-mine, to a Clyde shipyard, to several bridges under construction in the Scottish Lowlands, (including the Forth Road Bridge *) the Clyde tunnel and other projects, to the Timex watch factory, to the jute mills. Places where real engineering, unlike the theory we were studying, was being put into practice. A coach-load of students, suitably refreshed require frequent stops, particularly on the way back from a visit. On one famous occasion, are details still held within the records of the Grampian Police? we were nearly arrested en-mass for being a ‘public nuisance’. Twenty young men urinating up against a wall, by the roadside! (*) I do recall the cable (‘spinning it was called but it was actually ‘laying’) system -perhaps an introduction to my later textile career. Of course somebody will have been doing the sums. There are of course a number of different sums to do, and to balance against one another. Is a single bridge sufficient in the 21st Century ? What is the potential cost to the economy if there is just a single bridge which is closed for essential maintenance ? Wales has two bridges, and London has numerous bridges, just a few metres apart. I don’t see a good reason not to have built the new bridge. Will a timid driver feel safe enough to use this bridge during high winds or other bad weather? I think this is one aspect overlooked by bridge designers. They may be brave enough to dangle from a wire at 500 ft, but a lot of ordinary drivers are not that brave. Given how bad the weather can be there, a tunnel in the sky, might have been a better option. When I was an apprentice at Dounreay we had a trip to the industries in the south of Scotland. Included was a trip to the new forth road bridge. The manager gave us a talk about the construction and his answer to our query about the suspension cables material being used was not stainless steel, which we were very familiar with, but high tension steel that would not corrode as the close packing and outer covering would protect it. Our own site was on the coast and we had seen the effects of salt water on all steels. When pressed the manager got quite short with me in his answers. I still have a picture of one of the anchor points but not of him sadly.